The plane of today is Republic F-105 Thunderchief, which is was a supersonic fighter-bomber used by the United States Air Force. The Mach 2 capable F-105 conducted the majority of strike bombing missions during the early years of the Vietnam War; it was the only U.S. aircraft to have been removed from combat due to high loss rates. Originally designed as a single-seat, nuclear-attack aircraft, a two-seat Wild Weasel version was later developed for the specialized Suppression of Enemy Air Defenses (SEAD) role against surface-to-air missile sites. The F-105 was commonly known as the “Thud” by its crews. 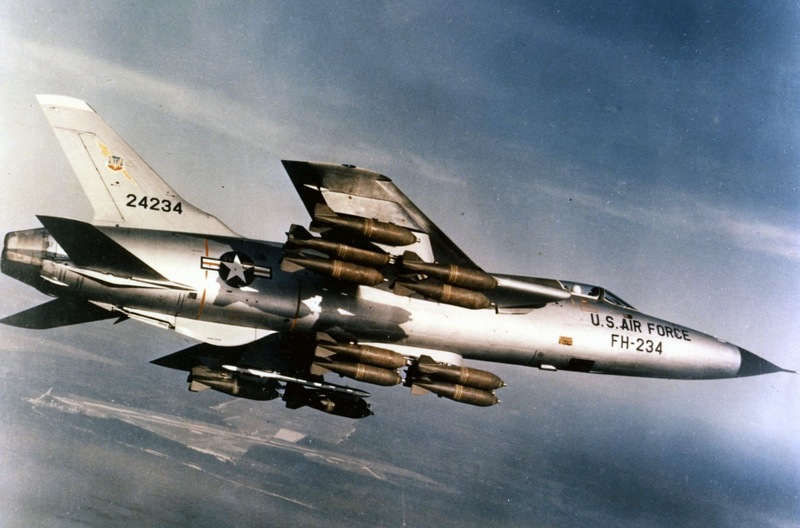 A Republic F-105D Thunderchief in flight with a full bomb load of sixteen 750 lb bombs on its five hardpoints. ← Not an awful lot to report except for exams and Halloween festivities.